Acre lot with BIG Ranch on Finished Basement. Click VIRTUAL MEDIA link for VIDEO. Feels like country living, but only 3 miles to major shopping. 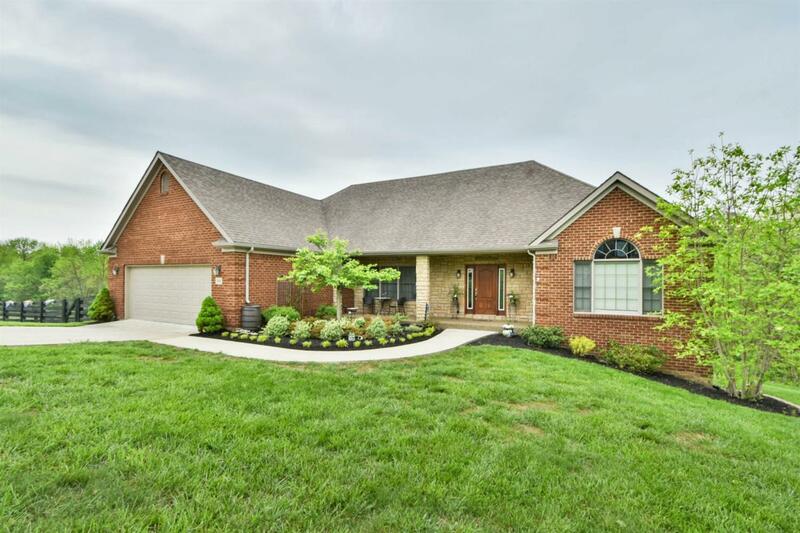 Brick with Stone Accents, wonderful curb appeal including well-designed Flower Garden at front entry. Finished Wood Ceiling above Covered Front Porch. Inside, an Open Floor plan with HARDWOOD, Formal Dining Room, Great Room with Stone Fireplace. Open Kitchen features Stainless Steel Appliances, Granite Counters, Breakfast Bar with seating. Split plan with 2 guest bedrooms & full bath on one side, with separate Laundry, & Master Suite, more Hardwood, a Walk-In Closet, Tiled Bath with HUGE Tiled Walk-In Shower on the other. Oversized 26 x 25 Garage for cars and TOYS. Huge 1st floor COVERED DECK with WOOD Barrel Ceiling looks out over the back, basement patio below. Finished Basement is Awesome, with 2 more bedrooms & Spa-like full bath, open Living area, ANOTHER Stone Fireplace. Side yard is Plank and Wire fenced. Firepit & seating under trees. Location Description: Wooded Lot, Homeowners Asoc.